hey cassie! will the malec first time scene be an online post like the clace one, or will it be a bonus in a future book? Because the project isn’t set up by me, I can’t tell you exactly when the story will be available. Also it’s turning out longer than I thought (what a surprise). But you know, in the next few months likely. Furthermore, we were told that “it is a short story for an lgbtq charity.” As soon as we know more we will let you know! I’m so excited about this! I always assumed they first slept together during their trip, so its great to know that that assumption was in fact right. Can’t wait to see how the story turns out!!! Reblogged this on Pensiero Satellite. Was the Jace and Clary one just an online one? Because I remember reading that on her tumblr. And will you guys let us know when this hits? If I have the money I most certainly will be donating. The Jace and Clary one was an extended scene which Cassie posted on her tumblr. The Malec extra will be for charity and as soon as there’s more information, we’ll post about it. My guess is that the scene will be sent to you once you have donated money. Wait, what Clace story? I remember Not For Humans, wasn’t that the one with Jace running down Madison Street naked? That was hilarious. Is there another short story with Clary too? 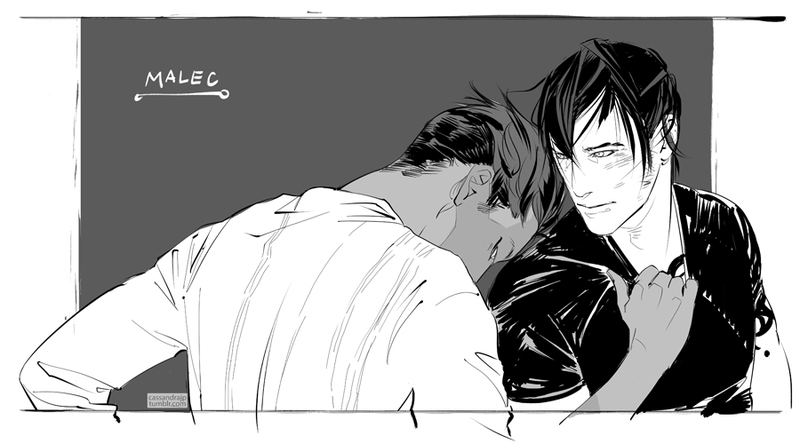 Ah..I remember Malec’s first kiss. And their first date in the Bane Chronicles. I love all of these couples so much! Also, i have a doubt, in Biten Magnus said he would marry Alec in a shawdonhunters tradicional weeding, but in lady midnight, i think its Emma questions why they didn´t since SH and Downworld can marry? did a misunderstand that? The Malec extra will only be for the charity site. As soon as Cassie has released more information we will share all the details here. Shadowhunters and Downworlders can get married, but I think Magnus wants Alec to be able to get married in gold. As if both of them were Shadowhunters. I thought that was the reason, but i got a bit confused during LM. Even if I´m not a lesbian, I love the fact that there are several homosexual couples in the Shadowhunter-World. I´m from Germany and there are hardly any gay/lesbian couples in the books/movie/TV. But I hope that things will Change soon. Three weeks ago, our former Minister of foreign affairs died after he battled with cancer for two years. And the tears of his widower moved the entire Country. Soap operas like “GZSZ” had some gay/lesbian couples way back, but I agree with you, there needs to more diversity in German books, films and on TV. I liked the line where Magnus refers to the Lightwood family (who first appeared in the Infernal Devices) as “sort of low-rent Borgias” and always plotting. Then he says that Alec is an exception because of his straightforwardness. Ok OK i am a little bit behind here so was it already released Ö_Ö ?!?! Nope, it’s very likely going to be in Cassie’s adult trilogy about Magnus Bane. Love this. But I think Sizzy deserves a short story too. I mean, besides Tales of a Shadowhunter Academy.